Bethlehem, Pa., January 28, 2019—Inspired by her mother Joan’s generosity and love of preparing tasty and nutritious large meals, Ellen M. Kraft, Esq. is encouraging people to prepare foods that can be shared with others in need. “Joan’s Kitchen” is a new program intended to teach new cooks, and encourage seasoned cooks, to prepare large amounts of homemade soup (Ellen’s mom's favorite and a favorite of many elderly) and share it within their circle and beyond. 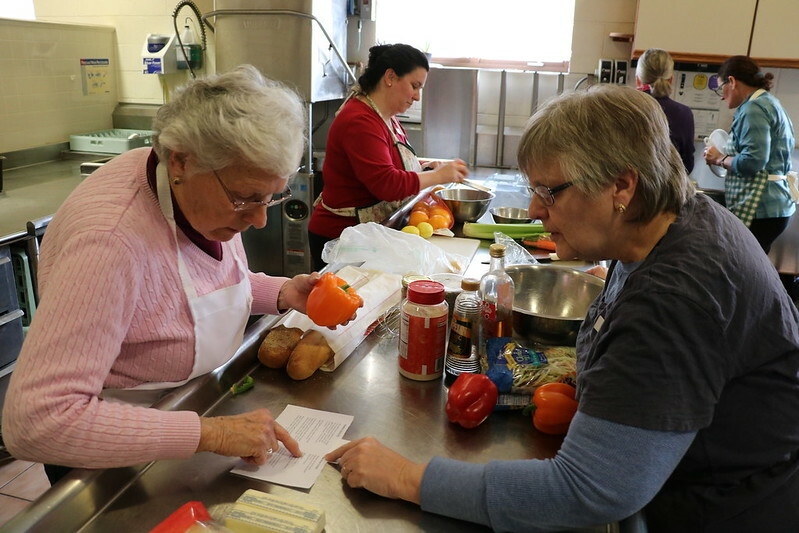 Joan’s Kitchen will officially kick-off in 2019 with a program session held on Sunday, February 10, from 2:00 to 4:00 p.m., at the St. Francis Center for Renewal in Bethlehem, Pa. The idea behind the cooking sessions is to teach 6-10 people how to make tasty recipes that are nutritionally dense and produce a large portion of food that can feed many people—sometimes for the cost of a bowl of soup at a restaurant. Joan Kraft (1924-2015) was known by all as a compassionate and generous woman. She taught her daughter Ellen to cook and to bake at a very early age, and encouraged her to share her home-made bounty with others whenever possible. In her later years, Joan was no longer able to cook for herself or for others due to health issues, but she continued to enjoy the wonderful meals prepared by her family. It was during those years that Ellen recognized the need for others like her mother to receive tasty and nutritious home-cooked meals, soups or snacks, regardless of their economic station in life. Sunday, February 10, 2019— 2:00-4:00 p.m.
Sunday, April 7, 2019— 2:00-4:00 p.m.
Sunday, June 9, 2019— 2:00-4:00 p.m.
Sunday, August 11, 2019— 2:00-4:00 p.m.
Sunday, October 6, 2019— 2:00-4:00 p.m.
Advance reservation is required; space is limited. Contact Sr. Virginelle Makos by calling 610-867-8890. “Delivering a container of home-made soup or a plate of cookies to someone who no longer has the energy or desire to cook for themselves, coupled with a friendly visit to that person who may not receive many visitors, is an easy and inexpensive way to live our Faith,” Ellen concluded. The Joan A. Kraft & R. Wayne Kraft Memorial Fund was established in 2016 by former LVCF Board of Governors’ member, Ellen M. Kraft, Esq., in loving memory of her parents. The donor-advised fund provides grants to charitable organizations in the region, as a means of memorializing the philanthropic nature of the late R. Wayne and Joan Kraft. R. Wayne Kraft, Jr., was a 1948 graduate of Lehigh University, who served in the US Army Corps of Engineers during WWII. Dr. Kraft returned to Lehigh in 1962 as a Professor of Metallurgy and Materials Science. He was a specialist in the fields of physical metallurgy, X-Ray diffraction, solidification and crystallography. He held multiple patents, wrote more than 50 technical papers and received multiple professional awards, including the prestigious Bradley Stoughton Award. He also taught philosophy at DeSales University and was an ordained Deacon in the Allentown Diocese. Joan Auchter Kraft was a 1946 graduate of Cornell University, receiving a degree in the field of Home Economics. She taught at the Connecticut College for Women. Joan became the first woman to serve as a volunteer associate chaplain at St. Luke’s Hospital, having obtained a degree in pastoral care. Among her many talents, she was an excellent cook and was always the first to deliver a batch of homemade cookies to a new neighbor or to take a pre-made casserole dinner to someone coming home from the hospital or grieving the loss of a loved one. She worked tirelessly at the New Bethany soup kitchen until she was in her 80s and encouraged volunteers to be cheerful and interact with those who came for a meal, not just serve them their food.